Everybody knows exactly how it feels to walk around with gum on your shoe it on a hot day. A funny thing though, no matter how much dirt and gunk sticks to it, you’ll always be able to see the pink bright as the second it was spit onto the ground. And the person walking behind you will be able to see the bright pink clearly with every step you tape. It’s pointless to shuffle across the ground and scrape it off, you’ll just spread it, and then the sole of your shoe will be pink and sticky. No, best to find a stick, scrape it off, and wait for the next person to step in it. And the next person and the next person and the next person and hey wait a minute does gum ever actually make it into the bin or does it just spend an eternity suspended in the moments between somebody stepping on it and somebody scraping it off. Hey, know what else is immortally pink, laughs in the face of destiny and been stuck to at least a few pairs of shoes? This bike. Of course, not this exact bike. That bike was a little weathered, the paint needed a good shinin,’ some of the old parts were a bit heavy, or just not very well designed for what we had in mind. So, here’s what we did to it, and why we did it. P.S, MIJ means it is made in Japan. I know it was the Taiwan of the day, and wasn’t that rare or anything, but we’ve tried to keep as much of the parts on it MIJ because of the benchmark of quality they’ve set over the years. Frame - MIJ Nishiki Carrera Step-Thru (Made from straight gauge seamless Tange MTB tubing) Frame has been lug lined, which is not very common for a mass produced bike such as this one. Straight Gauge tubing is pretty standard on step-thru frames, since the last thing they need is more flex. There isn’t any rust, and everything is bone straight. It was lightly ridden by a light lady for several years and kept in a dry basement for many more years than that, but not as many years as it has left to ride it. This bike has been to Africa and back, and many more adventures I’m sure. 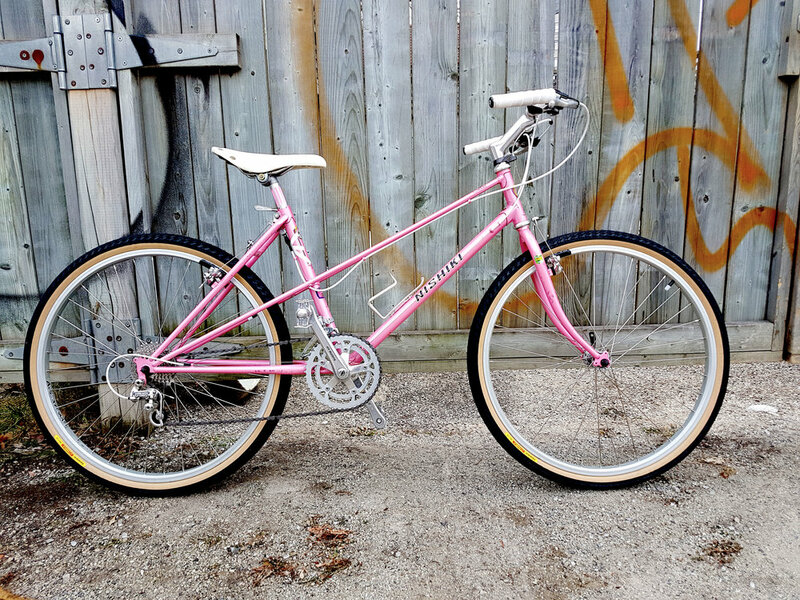 For more information look at the description for the metallic blue Miele “Diamond in the Rough” bike we put together, which was purchased from the same seller. Wheelset – Shimano Acera 36H. These hubs can be rebuilt infinitely, and can be adapted to run up to a ten speed cassette. The rims are Alex DM24 Rims, which have a much greater inner-width than what the bike came with. 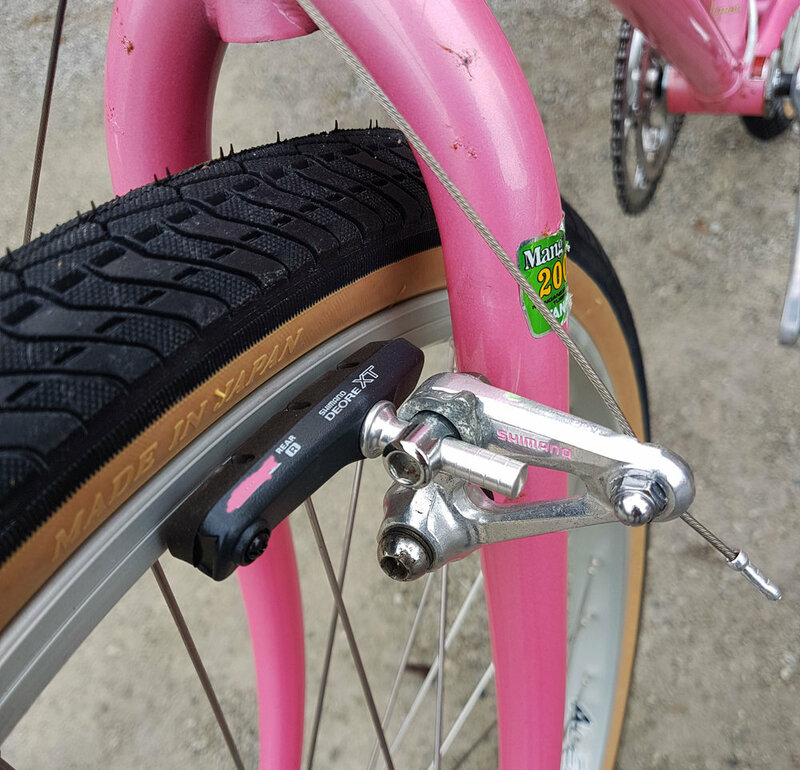 This means less pinch flats, and can operate at a very low pressures (for comfort/speed when it gets rough) without feeling floppy or damaging the sidewalls. They are the same rims used by most Police bikes, because they are strong without being terribly heavy. The 36 spokes front and rear means they can handle plenty of weight and shenanigans. Tires: MIJ Panaracer Pasela 26x1.75” in Skinwall. A skin wall is different from a gum wall, which is different from a standard wall. For it to be called a skin wall, the walls need to feel just barely more pliable than a thick piece of paper. A shocks, and especially road vibration, go up into the tread it is the sidewall that soaks up most of it. The softer the sidewall, the more vibration is absorbed, the more comfortable you are and faster you go. Shifters: Old/repaired MIJ Shimano friction thumb shifters. They aren’t anything too special as far as finish quality is concerned, but the bushings are mint. Each shifter is made completely out of steel/aluminum, so they might be the most durable part on the bike. 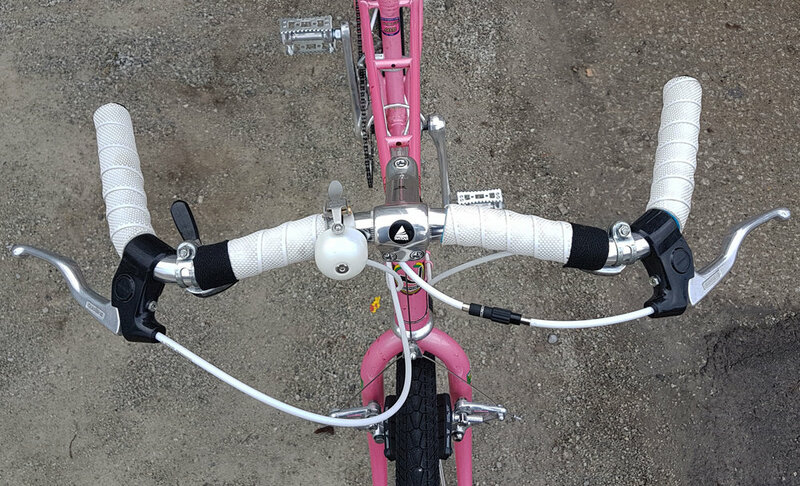 Non-indexed means you can make the shifter work with any gear system that operates by pulling a cable. 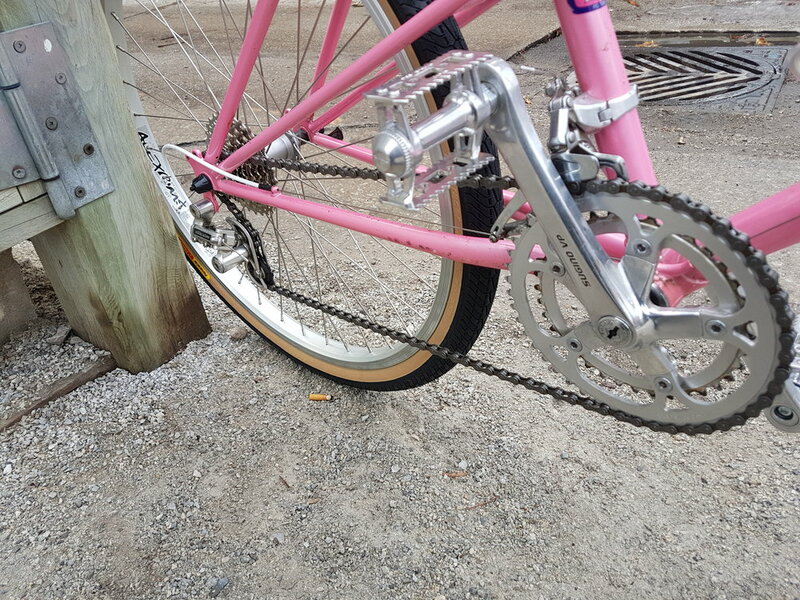 It is a pain, but it’d even work with internally geared hubs. For most 99% of people this is not a relevant feature. BUT, when you walk into your local bike shop and somebody tries to tell you it’s incompatible, or broken, or going to cost an extra leg on top of the arm you already paid to make work “juuuuuusst riiiiight,” you can at least be informed enough to know it’s a fast one, and that may end up saving more money than any other part on the bike over the course of ownership. Derailleurs: Front – MIJ Vintage mid-high-level Shimano. Fully metal, and has on of the most overbuilt clamps I’ve ever seen. Basically the same as a Deerhead XT (top of the line for the time), just not all aluminum. MIJ Suntour Cyclone 1700. This is the crowning jewel on this bike, in my opinion. I first received it with a snapped spring. Repairing the spring was so easy, that at the time I kind of felt bad for the person who gave it to me. The whole spring assembly came apart with one bolt, and it took about 15 seconds to understand in it’s entirety. This doesn’t seem that important, but to somebody who might end up stranded many miles from home, it can be a lifesaver. I’d hazard a guess to say that certain brake springs could be substituted for the stock Suntour one, with a bit of persuasion. Aaaand boy lemme’ tell ya, it’s a lot easier to find a brake spring than a derailleur pivot spring in a scrap heap. Cranks: MIJ Sugino VP cranks. Cold forged they should last at least as long as the frame. The rings are still in plenty nice shape. Set up in CX double gearing (46t/36t) for the time being, with drillings for a triple if that’s preferred. The smaller wheels accelerate a surprising amount faster than 700c wheels, but top out faster, so having a good big ring is nice for bike lane cruising. Yes, we know we got the pads on here backwards. They were corrected immediately afterwards. Brakes: MIJ Shimano Exage Cantilever (AT50) brakes. These are nearly identical to the more-expensive Deerhead brakes, with the difference being only finish quality instead of performance. After a silly amount of wet-sanding and polishing on our part, the only difference is the stamp. We custom filled the engravings pink to match the frame and theme a bit better. The paint was then waxed over with Carnauba to seal it from the elements. The brake pads are NOS shimano M730 XT Cantilever brake pads. I love these things. The shape is such that there is nearly no vibration, and the angling on the pads allows for the most even possible wear to the rim. They make the least dust of any compound I’ve used, and outlast just about anything else on the market. They are cartridge style too, so it is very easy to find replacement pad cartridges in any compound you want, including Scott-Mathauser. Pedals: MIJ, MKS Sylvan Stream pedals. Re-built with very fancy grease we like best, packed into every crevice, nook, cranny, crack, hidey hole etc. We could probably put a dollar figure on the amount of grease used in each pedal, but we won’t. BB: MIJ Loose ball sealed Shimano Exage unit. Bearings were in fine shape, but we replaced them anyways. Races were unpitted and smooth, so we just gave it the same treatment as the pedals. This time there is probably a 2 digit figure we could put on the amount of fancy grease packed up in there. Bars: Velo Orange Porteur Bars. I like that I can wrap the middle portion of the bar like a moustache bar, and unlike a moustache bar it is comfortable in more positions than the most aggressive. The flat section should feel like a flat bar, giving your shoulders and back a rest from the very upright other position. These do that, I’d say, very well to boot. Tape: Brooks Cambium Rubber in white. This tape can be re-used from bar to bar to bike to bike, and if it gets dirty you can just clean it off with rubbing alcohol or hand sanitizer and it’ll look brand spanking new every time. It is waterproof, so you can have a bit of grip even in the rain instead of feeling like your grabbing sponges. A bit more cushioning for comfort on long rides. Bar-Ends: MIJ Simworks/Nitto for style points. Seatpost: MIJ SR Fluted seatpost. I hand-filled the fluted portions with the same pink as used on the brakes, and sealed it with carnauba wax for durability. It’s not high wear, so wax should last a very long time, and harden into the surface of the paint itself. Seat: Made in Taiwan, some white faux-leather piece we felt suited the look. Take it or leave it.